* Offer Valid for Online Booking. book your ticket online get 20% off. Note : Read carefully Terms & Conditions. Hawa Mahal (Inside View), City Palace, Jantar Mantar, Jal Mahal (Front View), Jai Garh, Nahargarh, Nahargarh Wax Museum, Gaitore" Cenotaphs (View on the Way). Raj Mandir Cinema Hall (will be shown view on the way), Statue Circle (will be shown view on the way), Amar Jawan Jyoti (will be shown view on the way), Vidhan Sabha Bhawan (will be shown view on the way), Laxminarayan Temple (Birla Mandir), Hawa Mahal (will be shown view on the way), Jal Mahal, Amber, Albert Hall, Masala Chowak (Dinner as per your choice). Rajmandir Cinema Hall, Statue Circle, Amar Jawan Jyoti, Vidhan Sabha Bhawan, Laxminarayan Temple, Central museums, Ram Nivas Garden, Hawa Mahal (Front View), Jal Mahal (Front View), Amber Fort & Palace. Rajmandir Cinema Hall, Statue Circle, Amar Jawan Jyoti, Vidhan Sabha Bhawan, Dinner at Amber pride resort or chokhi dhani resort (as per your choise). Evening tour all monuments will be shown view on the way. Evening tour Amber light & sound show charges paid to be client directly. Evening Tour 5, after sightseeing dinner at Amber Pride or Chokhi Dhani(as per your choice). Dinner charges paid to be client directly. Tour no 2 3 4 and 5 will be operator minimum 10 passenger required. Monuments entrance fee, camera charges to be paid by guest at respective monuments. Amber fort walk is recommended. 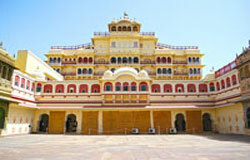 Hiring jeep to reach at Amber fort, charges to be paid directly(sharing basis). Monuments entrance fee, expenses of personal nature, camera charges/jeep/camel/elephant ride charges, meal, lunch and dinner. Toll tax, parking, driver allowance/ all state tax.